At the end of each passing year, we nostalgically look back on lists of highs (and lows) from said year. Then, at the beginning of each new year we enthusiastically attempt to predict what will happen in the coming months. As our team reviewed various expert predictions on meeting trends for 2017, there were two that got us particularly excited. Coffee is huge in Columbus. In 2014 we created the Columbus Coffee Trail and a way to help visitors best experience the quality craftsmanship and commitment to education evident in each cup of coffee brewed in our local shops. Nearly all of the stops on the trail are within walking distance of the Greater Columbus Convention Center, or a short ride on the Cbus, Columbus’ free downtown circulator. 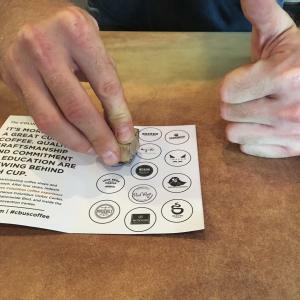 Upon visiting a stop on a trail, guests will receive a stamp on a Columbus Coffee Trail passport and after receiving four stamps, passports can be redeemed for a free coffee trail t-shirt at any Experience Columbus Visitor Center. Visitor Centers are conveniently located within the Greater Columbus Convention Center as well as in the nearby Arena District. It’s easy to find great coffee in Columbus and the t-shirt serves as a useful memento for a memorable experience. There are so many different opportunities for team building in Columbus! Our team loves food, so of course our favorite options are taking a hands-on cooking class together (then enjoying our spoils at the end!) 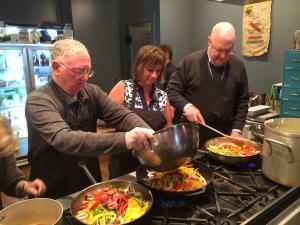 or going on a culinary tour with Columbus Food Adventures. Or, for those looking to do something other than eat, the popular escape room phase has hit in Columbus as well. We have a variety of options, ranging from some more intense rooms where participants are handcuffed at the beginning, to less intense riddle-solving rooms that could involve helping a crazy cat lady find her lost best friend. Whatever attendees are looking for, whether it be craft coffee, unique team-building experiences or anything else, it can be found here in Columbus. Just ask us!